Mint-Basil Marshmallows | "Il faut goûter"
At this time two years ago I was preparing myself for a nine-month sojourn in France. I had the most awesome opportunity and experience as an English Assistant in France, which allowed me to 1) work only 12 hours a week teaching stylish French highschoolers, 2) enjoy lots of vacation (travel) time as an employee of the public education system, and 3) live my daily life as une française, eating and shopping for those French products that I still miss like crazy (like fromage Saint Felicien on morning toast). 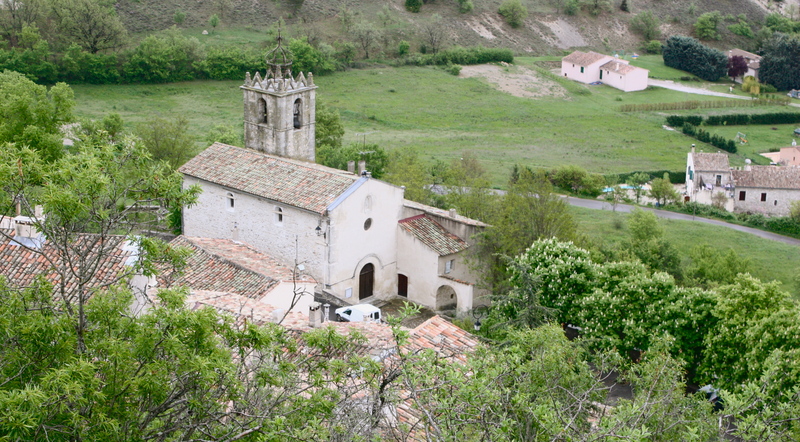 Perhaps one of the coolest things I did while in France was work, through the WWOOF France program, on an organic farm–Ferme de la Bertine–for two weeks in the south of France in a little village called St. Maime (Alpes de Haute Provence region). This family-run farm produces cheeses, fruit juices, jams, liquors, and various other fruit and vegetable products to sell at local markets. As a “wwoofer” I was expected to work around 5 hours a day in whatever capacity they needed me in return for being housed and fed (and fed well!). My favorite days, glowing golden in my mind, were when Camille asked me to help her in the kitchen. When I was there in April 2010 she had recently added candy making to her repertoire of skills, and a few times she had me prettily packaging dainty chocolates made with olive oil. One day when I entered her kitchen workshop there were curious little pale-green squares laid out on wax paper. I snuck a bite. The taste was new and unique for me: sweet and slightly herbal; the texture was familiar: soft, chewy, pillowy. Those were marshmallows! Camille revealed the mysterious flavor: Sage! 3. Turn the mixer on low speed and, while running, slowly pour the sugar syrup down the side of the bowl into the gelatin mixture. Once you have added all of the syrup, increase the speed to high. 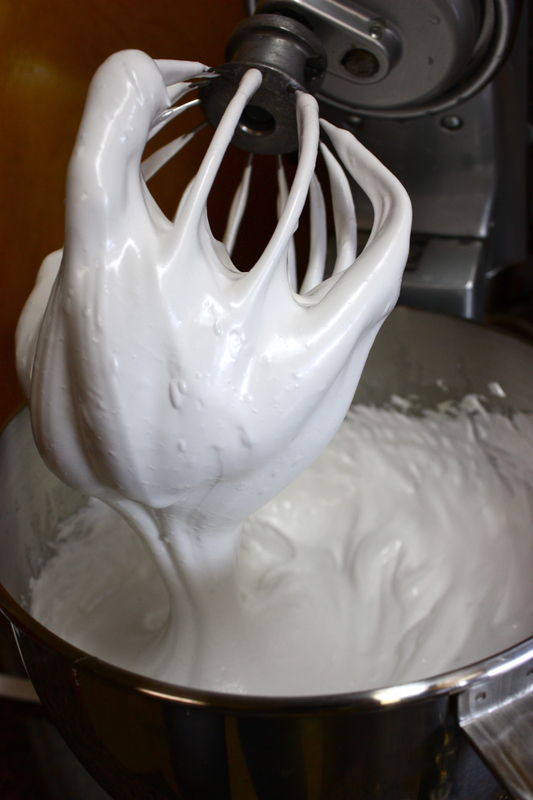 Continue to whip until the mixture becomes very thick and is lukewarm, approximately 12 to 15 minutes. Add the vanilla during the last minute of whipping. While the mixture is whipping prepare the pan as follows (step 4). 4. Combine the confectioners’ sugar and cornstarch in a small bowl. Lightly spray a 13 by 9-inch metal baking pan with nonstick cooking spray on bottom and sides. 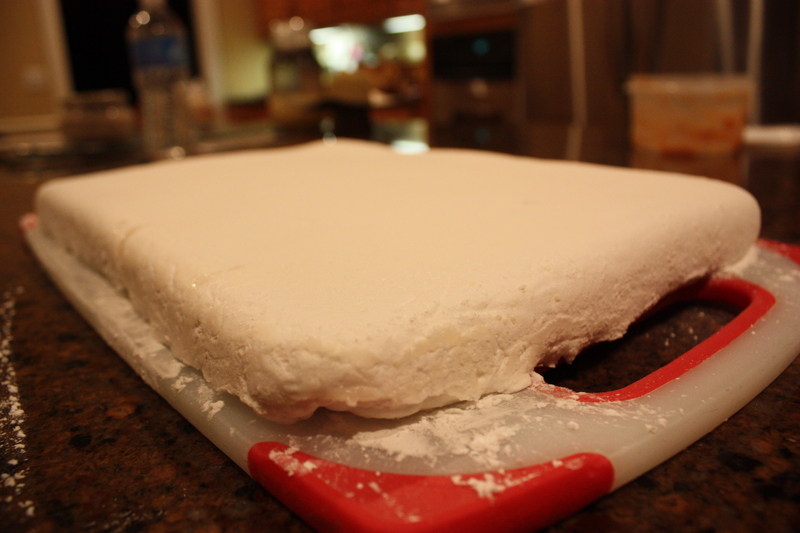 Add the sugar and cornstarch mixture and move around to completely coat the bottom and sides of the pan. Return the remaining mixture to the bowl for later use. 5. 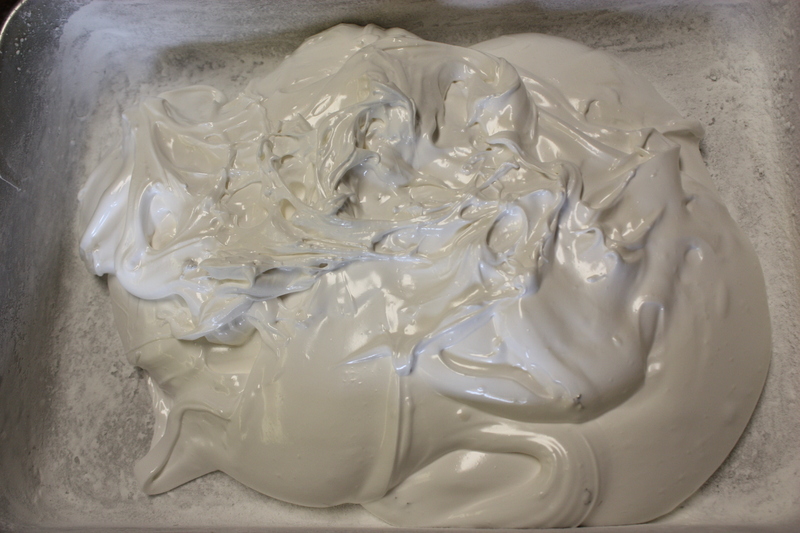 When the marshmallow cream mixture is ready, pour it into the prepared pan, using a lightly oiled spatula for spreading evenly into the pan. *With wet fingers, you can press the mixture to even it out and it won’t stick to the mixture! 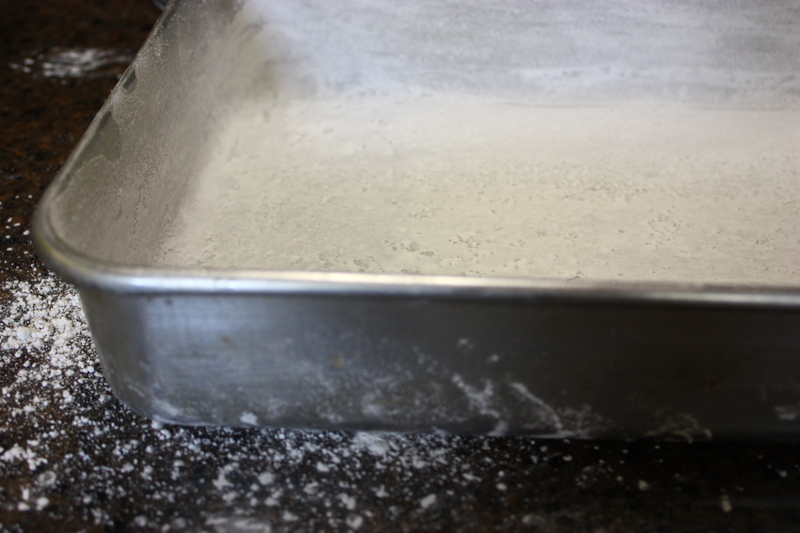 * Dust the top with enough of the remaining sugar and cornstarch mixture to lightly cover. Reserve the rest for later. Allow the marshmallows to sit uncovered for at least 4 hours and up to overnight. 6. 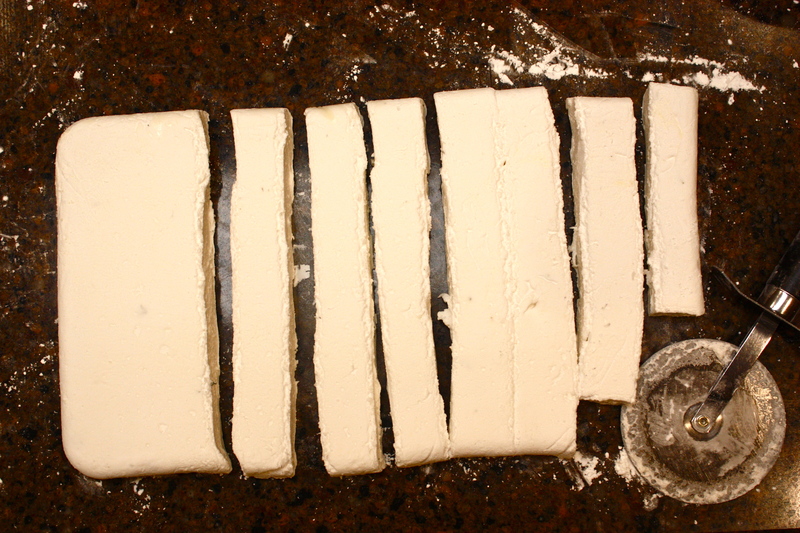 After at least 4 hours, turn the marshmallows out onto a cutting board (coated with the confectioners’ sugar/cornstarch mixture if you didn’t coat the top with enough) and cut into 1-inch squares using a pizza wheel dusted with the confectioners’ sugar mixture. 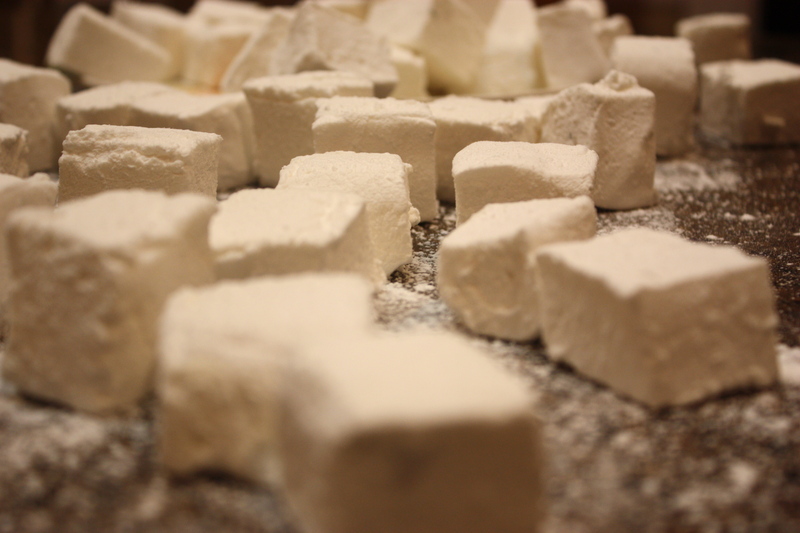 Once cut, lightly dust all sides of each marshmallow with the remaining mixture, using additional if necessary. Store marshmallows in an airtight container for up to 3 weeks. 1) Please make homemade marshmallows! The process is really quite easy and strangely satisfying! 2) Flavor possibilities are really endless here. 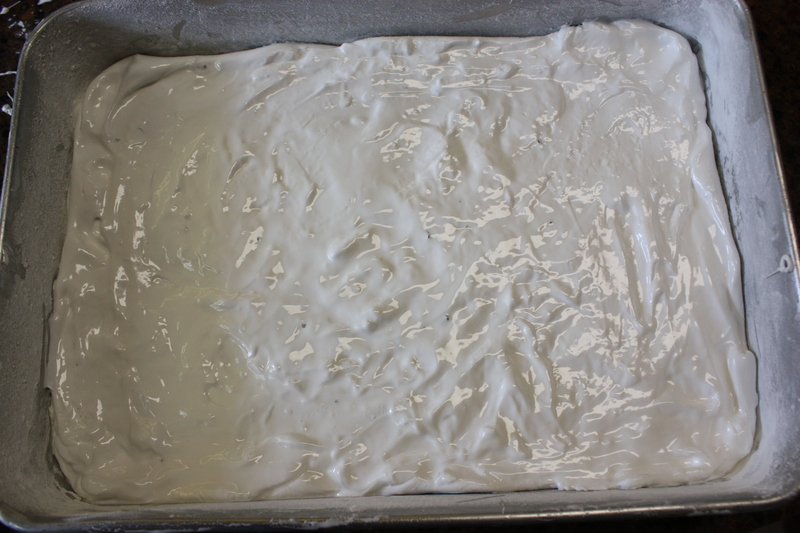 I’m already envisioning ginger, coffee, sage, lemon, and almond marshmallows in my future! 3) To make vanilla marshmallows, just leave out the mint and basil and increase the vanilla in this recipe to 1 full teaspoon. 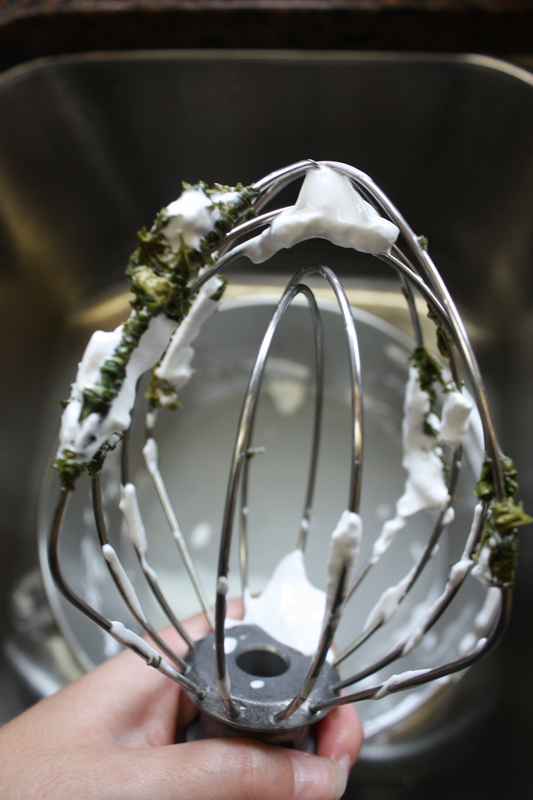 4) The reason you don’t have to strain the mint and basil leaves out of the sugar mixture is because when you whisk the marshmallow cream rapidly in the stand mixer, nearly all the leaves stick to the whisk (you might have a few stragglers, but it’s no big deal)! 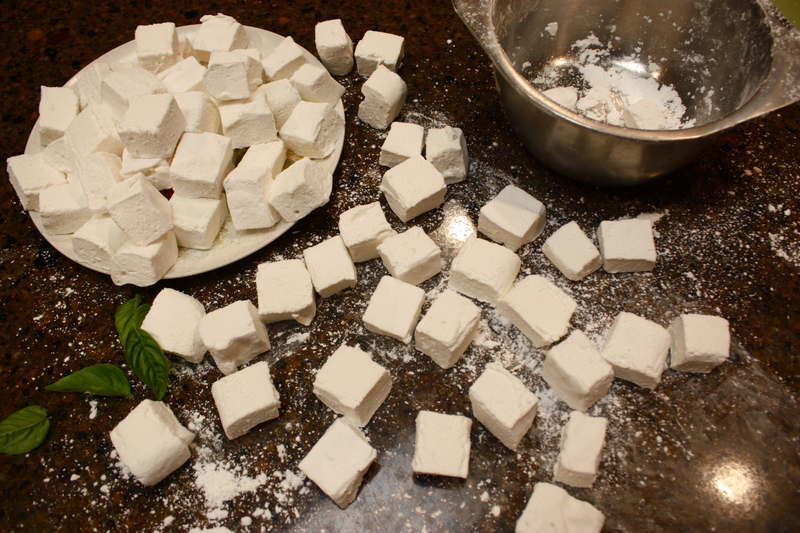 This entry was posted in Sweet and tagged food, homemade marshmallows, marshmallow, mint basil marshmallows, recipe, WWOOF France by needtotaste. Bookmark the permalink. Yayyum! I wanna see it! Thanks for sharing with your Mom’s friends! We shared them around the lunch table last week. Such a unique, unusual, but addictive flavor. I loved them!! I hope you can find the stuff! They are so much fun to make! It’s good to hear from you, I hope all is well with you and Nelli. I just made this recipe and it can’t be right. 3/4 cup of basil and mint??? I could not get all of it out of the finished product. Next time, I am going to fill a tea ball with the herbs. I even tried to strain it but the syrup makes that almost impossible. 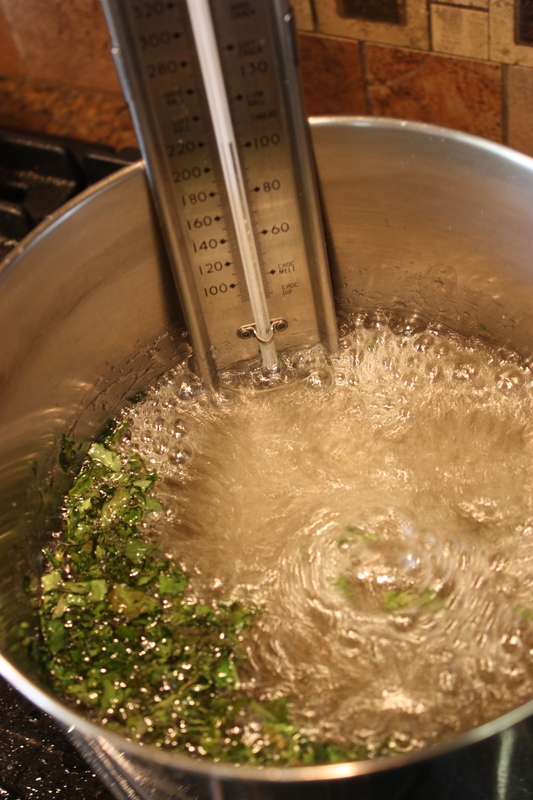 Hello–I’m sorry if the recipe wasn’t clear–it means 3/4 cup total of the mint and basil (not 3/4 cup of each herb). When I make these, the leaves stick to the whisk of the stand mixer during step 3. Oh, I understood 3/4 cup mixed together. I did use a hand mixer because I don’t have an electric mixer. A few stuck to the blades…and the texture was not that of a marshmallow..much denser which I am chalking up to the difference in mixers.